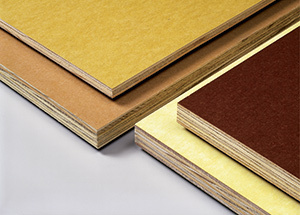 Plywood panels are available with many types of face enhancements. Two common face coverings are a Medium Density Overlay (MDO) or High Density Overlay (HDO), which are resin-impregnated fiber surfaces bonded to one or both panel faces under heat and pressure. Other types of enhanced surfaces include fiberglass-reinforced plastic, polyethylene (HDPE), hardboard, metal and other materials for exceptionally smooth or special-use surfaces. Reference HDO/MDO Plywood, Form B360, for more information. Panels with A-grade, B-grade and C-Plugged-grade veneer faces are usually used in panels with enhanced faces to ensure a smooth solid face to finish or receive the overlay. It should be noted that when presented with moisture in the form of humidity, vapor or liquid, the grain of the wood may raise and the surface area could become uneven and transfer through thin overlay materials. 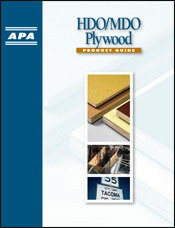 For a full description of veneer grades, consult Panel Design Specification, Form D510. These panels are especially designed for engineered applications such as structural components where design properties including tension, compression, shear, cross-panel flexural properties and nail holding and bearing are of significant importance. Please see section 5.6.5 Structural Panels in Voluntary Product Standard PS 1-09 Structural Plywood, Form L870 for details on veneer species and grade and bond durability requirements. 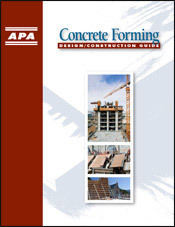 B-B concrete form panels are manufactured in two classes: Class I and Structural I. Panels are sanded on both sides and treated with a release agent unless otherwise specified. Class I panels will have faces of Group 1 species, crossbands of either Group 1 or 2, and center plies of any of Group 1 through 4. Structural I B-B Plyform panels are also sanded and have Group 1 veneers throughout. They may also be overlaid with HDO or MDO. A common edge treatment is a tongue and groove edge that is used when engineered wood panels are placed together with their long edges adjacent to each other (one edge has a groove milled into it and the other a tongue). By joining tongue edges into grooved edges, a strong connection is created. This connection causes the adjacent panels to move up and down together when loads are applied near the edge. Also, different edge treatments are available for panels through a secondary manufacturing process. Research proves that a square edge on a panel deck performs as well as a bull-nosed edge and slightly better than a chamfered edge when edges are exposed to some types of impacts.